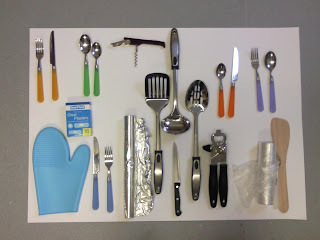 For my solo external drawing day I had to empty the contents of a container and proceed to arrange them in a visually interesting way, some examples we were given were; bag, trinket box, drawer, jewellery box, wardrobe, wallet. 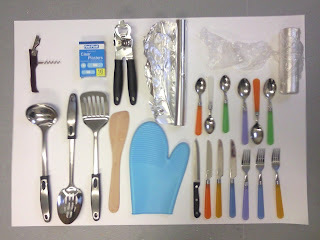 The requirements were that you had to use all object in the container, no matter how inconsequential they appear (even dust or fluff in the corners). 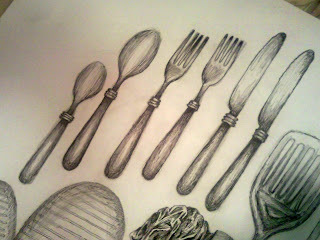 The Drawing had to be from a bird’s eye view- not a traditional still life view of the objects. 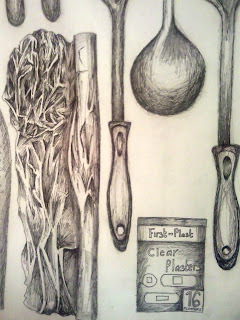 For the container I decided to use my kitchen drawer as there were some interesting shapes and metallic surfaces on the objects and utensils, I created some small compositional drawings and worked with the objects till I found a position that I felt suited them and made an interesting drawing. 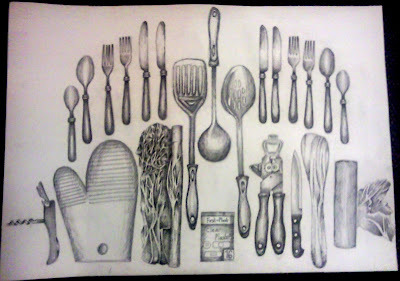 The drawing is A1 (594 x 841 mm -- 23.4 x 33.1 inches) which means the utensils and cutlery are life-size in order to fit them all in, I drew them with pencil then black ink. 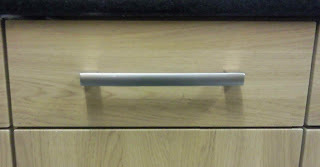 The project today has broadened my mind into what can be used to create art and how even mundane things like a cutlery drawer can be made interesting- personally I think it would be nice for a kitchen, with the black against the clean white paper and its organised sloping edges which give it a relaxed and almost homely feeling.